For young families, empty nesters, singles enjoying a quiet, but active community, retirees enjoying time freed from the workaday world, Ravenwood Forest is the place to walk, bike, play, watch the seasons change inside a forest or meadow-like areas. We have a development close enough to feel far away from the hubbub of city life, while in reality, we are in the middle of everything necessary to enjoy this mountain life. 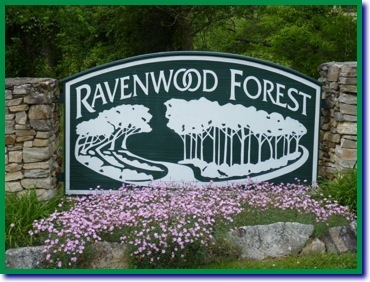 The Ravenwood Property Owners' Association exists to keep our community beautiful and inviting. By joining together, and having modest dues, the volunteer homeowners board works to represent all in matters involving Ravenwood Forest from sponsoring community events such as yard sales to work days to keep our entrance attractive and appealing. We also represent our subdivision when necessary as county or local events mandate our attention to preserve and protect our lifestyle and property values. With state maintained roads in our subdivision, convenient access to major highways, Asheville airport (AVL), hiking, fishing and enjoying the national and state parks, Ravenwood Forest is within 20 minutes of Pisgah National Forest, Holmes State Park, and Dupont State Park. All the amenities of the mountain life in western North Carolina are conveniently nearby from major shopping centers, theaters, major hospitals, schools and colleges, with an abundance of farmland providing the bounty of summer goodness and fall's apples, other seasonal fruits and vegetables, nearby houses of worship for all denominations, we truly are in the center of everything. That's why Ravenwood Forest is a very good place to call home.